John Esposito (left) fetes a delegation from the Egyptian Muslim Brotherhood's Freedom and Justice Party in April 2012. While not necessarily supporting deposed President [Mohamed] Morsi or the policies of his Freedom and Justice party, we note that he was democratically elected, and that his removal from office was effected by means of a military coup led by Sisi. 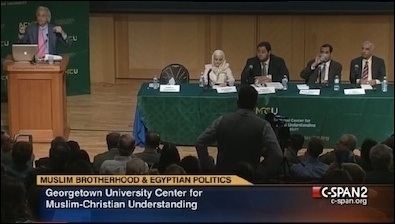 However, in 2012, Esposito happily appeared alongside members of the Freedom and Justice Party, the political wing of Egypt's Muslim Brotherhood, for an ACMCU-hosted panel discussion at Georgetown. At the time, he and other Middle East studies academics were instrumental in whitewashing the Muslim Brotherhood, downplaying its Islamist agenda, and encouraging—with great success—U.S. government cooperation. Esposito's ACMCU has received $20 million from a member of the Saudi royal family. This renders Esposito's objections to al-Sisi's visit suspect, much like his sudden antipathy towards "repressive and authoritarian" regimes, given that ACMCU has been bankrolled to the tune of $20 million by a member of the Saudi royal family, who rank among the most oppressive rulers on earth. Esposito had the audacity to complain about "philanthropic support for Islamophobic authors and websites" in a recent interview with OnIslam (read Robert Spencer's response here). He directs the Bridge Initiative, an ACMCU project that, like its UC Berkeley predecessor, the Islamophobia Research & Documentation Project, is dedicated to promulgating the myth of a shadowy "Islamophobic network" fueling the "anti-Islam and anti-Muslim bigotry" that it claims has "increased exponentially in the United States and Europe." Esposito labels his work at the Bridge "protecting pluralism" from the "forces of evil," but, in reality, such apologias serve only to protect the evils of Islamism from legitimate criticism. Is it any wonder then that Esposito and his ilk condemn al-Sisi, who, while remaining a strongman, has been one of the few Middle Eastern leaders to call for reform within Islam, to reach out to his country's Christian minority, and to fight Islamic terrorism? By Esposito's reckoning, that makes him a certified "Islamophobe."